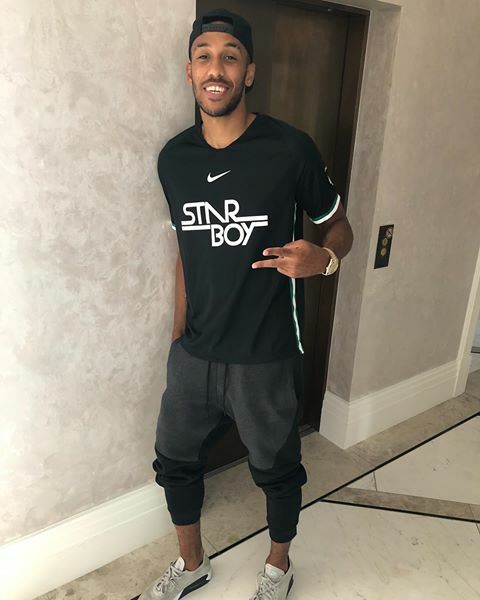 Arsenal forward Pierre Emerick Aubameyang posted a picture of himself in Wizkid Star Boy shirt on his Instagram page. "Thanks to the starboy @wizkidayo for sending me his new Jersey 👌🏽✌🏽#starboy ⭐️ #nike if you want some check the link in bio"
The Star Boy shirt which was recently launched in partnership with Nike is owned by the popular Nigeria music Star Wizkid. However Aubameyang is expected to be in action on Sunday when Arsenal take on Cardiff City in an away game.